What better way to have an amazing meal than hog roast Lymington style? It’s a certain way to impress a large party with some of the best cooked meat they’ll have ever eaten. Having chefs with years of experience and some of the best produce around at Spitting Pig we offer to provide one of the best eating experience you will have ever had. As we specialise in organising enormous banquets we will take the stress away from you, leaving to you to plan other aspects of your party that are also important. The Spit Rotisserie that comes on our machine is the ideal way to impress friends and loved ones with the pig roasting in the corner being a talking point for your whole party. The first thing your guests will see is going to be the hog slowly roasting and glazing over, being watched over by our head chef. Then their senses will be alerted to the smell of the slowly roasting pork which will overpower every other fragrance in the room. When the meat is finally served you will see why hog roasting has become such a success over the last 10 years and is now more popular than ever. We specialise in roasting the best crackling and juiciest pork you will find throughout the whole of Lymington. And because safety is as important to us as it is to you all these durable stainless steel ovens that we use are fully CE certified. So you can go ahead and get roasting knowing your oven is completely safe so nothing can really go wrong. Hog roast Lymington could be the ideal catering services to have at your wedding an easy way for everyone to be fed quickly. We have a selection of around 10 menus from which you can choose for a feast to remember at the most important day of your life. But don’t be alarmed if there’s something you want which isn’t on the menu as our chefs are at their most creative when helping to make a menu from scratch we can pacifically tailor a menu to suit your event. There are a few vegetarian options to choose from too so there will be plenty for every one on our menus as well with a selection of salads and sides to satisfy every palette. All of our dishes are made on the day and on location, as everything we serve is fresh and will not just be warmed up in the microwave and served at the meal. If you are looking to hold a corporate event then we can provide the ultimate meal to either impress new clients or reward your team. In the past we have done business functions for some major clients and have been left with some fantastic testimonials to show future customers. Our Christmas parties are particularly spectacular and who needs solely a turkey lunch when we can bring so many different types of meat to the feast? 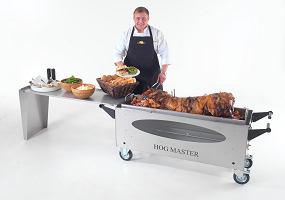 So if you’re considering a hog roast, just give pig roast hire Lymington a call, and let’s get you started, we’ll even give you a user tutorial so you can get the very best out of your chosen machine! Our ovens are all gas powered we use propane gas on our machines at events this means we can cook indoors too because they do not produce smoke so as long as your venue is well ventilated we can cook just about anywhere. So don’t hesitate to enquire if you have a question you would like to ask, using our hog roasting machines to cook the meat gives the user much greater control over the temperature making the roast completely under your control all you have to do is wait 6 hours for the meat to cook and your guests will be able to tuck in to some tasty meat. We do also rent out the Spit Rotisseries in Lymington for those of you who want to have a smaller party. The pig will cost you extra but it will be a welcome addition to any event you wish to throw. If pork isn’t to your taste you could instead roast a whole lamb which will hopefully set the feast off with the same spark and we can also supply Lamb for you if you just want to go for the hire option! The simple ignition switch on our machines makes firing the hog roast Lymington oven as easy as pie! Among all the other handy designs we’ve incorporated to maximise the efficiency of our ovens, we have also added wheels so now these great roasters can be transported with ease to any venue, whatever the terrain!